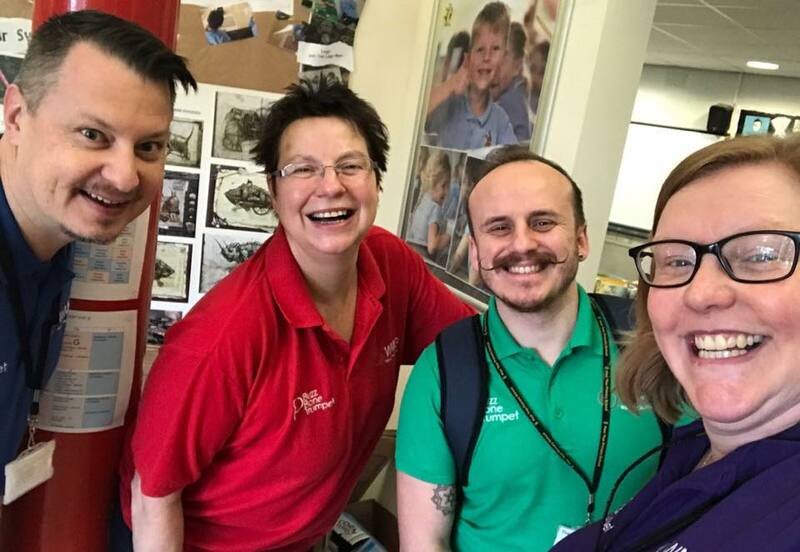 The WMG education team recently visited Pear Tree Primary School, Nantwich to take on perhaps their largest-scale project yet – getting the entire school playing pInstruments in one day! 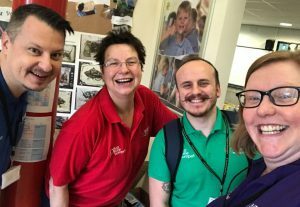 Our pPals Becca, Jonty, Darren and Helen tackled the challenge of getting 250 children playing 250 instruments at Pear Tree Primary. Although some of the children had experience playing brass, for many it was their first time playing either pBones or pTrumpets. Beginning with a whole school assembly, the team played for the pupils by way of introducing them to the instruments. Following the demo, Years 4, 5 and 6 had a go on pBones and pTrumpets while Years 2 and 3 tried out pBone Minis. Becca took the pBone mini players from Years 2 and 3, focusing on making a good sound through copying, and playing along to backing tracks, which culminated in playing along to Woody Herman’s ‘Woodchoppers Ball’. Helen took Year 4, 5 and 6 playing the F and G Samba, going on to playing Robbie Williams’ ‘Let me Entertain You’. Reception and Year 1 were busy on pBuzzes, learning how to make that all-important buzzing sound. Using Martin Yates’ “Learn to Play pBuzz” book, the little ones were getting involved with some fantastic activates, involving “I’m a little bee” and “I’m a little duck”, which is found in the book with full backing tracks. After lunch, all the children had mastered the basics and came together to show each other their progress so far in a mini-performance where they played ‘I Feel Good’ and the other pieces that they had learned in the morning. 5 hours, 80 pBuzzes, 65 pBone Minis, 35 pTrumpets and 70 pBones later – the whole of Pear Tree Primary were on track with their brass-playing journey and we’re sure it’s just the start of great things to come! 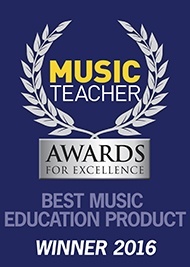 For more information, or if you would like our team to visit your school, please get in touch at education@warwickmusic.com.